We are trying to deploy elastic search vdb through Rest url. Below are the steps we followed. 1. We imported Elastic Search index through Import>Webservice Source>Source and ViewModel(Rest). 2. A Procedure has been created and we changed the procedure properties to Rest procedure. (When we import index from elastic search through Rest it is importing as Procedure unlike other sources which imports as table). 3. Created a Teiid VDB and added the ViewModel to the VDB and Deployed the VDB successfully. 4. Tried creating the war file and received an warning asking to use JDK 6 or above. We are currently using JDK 8 and we still see the same warning. We ignored the warning, generated the war file, added to the deployments folder but the war file failed to deploy. Below is the error. "Caused by: java.lang.ClassNotFoundException: org.teiid.rest.services.TeiidRestApplication from [Module "deployment.vdbtest_rest.war:main" from Service Module Loader]". I checked the war file and i see the TeiidRestApplication under the classes directory. At this point we are assuming JDK might be the issue but however we have given JDK 8 path in Teiid Designer and user variables under control panel. Any help will be very much appreciated. We still java issues. We weren't able to deploy the war file. The .java files aren't being converted to .class files. So we have changed our approach as below. 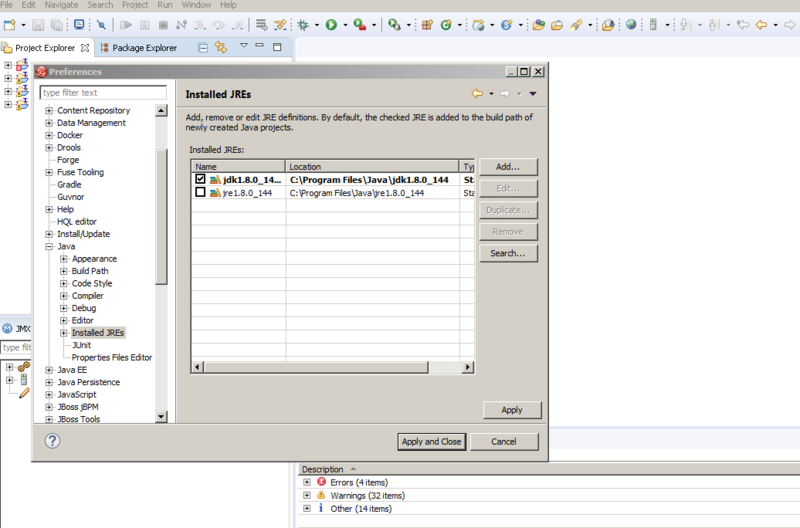 You won't get .class files if Eclipse can't find the JDK. 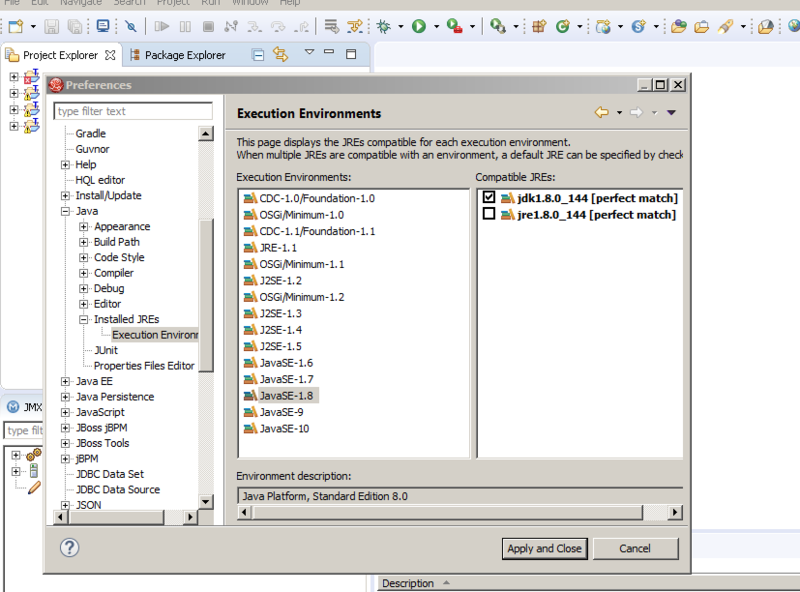 The JDK is required to compile the java files. I have assigned JDK1.8 on JBDS but i still have same issue. We found alternate way where the war file will be deployed automatically when we deploy the VDB. Im almost through it. Once that is successful i will add the thread link here. That's not going to get picked up in Teiid Designer. It has to be added to the eclipse.in as described above. Anyway, the auto-generated REST war is a fine approach. Also, you may want to take a look at Teiid OData. My colleague was able import invokeHttp and create a TABLE_A with SQL transformation between inokeHttp and TABLE_A for Teiidjdbc access. Data is accessible through squirrel. Then create RESTPROC_A and sql transformation between TABLE_A and RESTPROC_A, then create and deploy VDB using auto generate rest war option under properties and data is accessible through rest. we don't have to manually deploy war file in this approach. In my previous approach, war file is downloaded to my local and i need to add it to /standalone/deployments folder and it tries to get deployed but fails. So im working on my colleagues approach and im 80% through it. Was able to import invokeHttp, create table, sql transformation, create and deploy vdb for data is available from Squirrel. im left with second part. 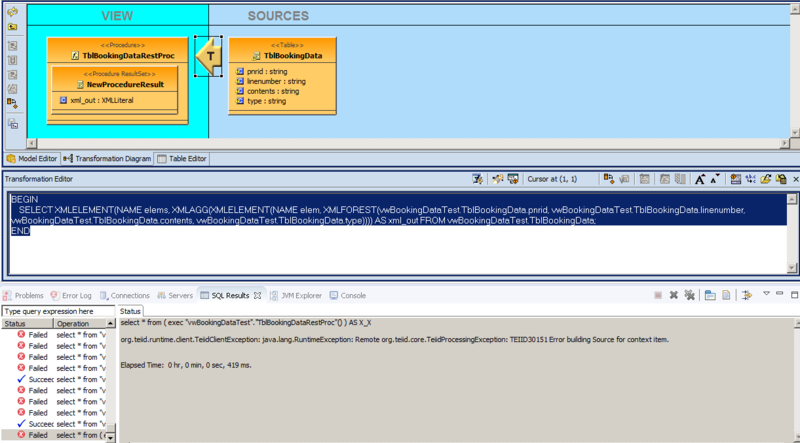 create RESTPROC, sql transformation and deploy the vdb using auto generate rest war option under properties. im aving issues with sql transformation betwen RESTPROC and table. Any help is very much appreciated. Thank you. For that it all depends on the Metadata you define on the procedure. See  for all the properties exposed, and you need to set them. For above transformation try to execute that directly and see what is the error. note SquirreL does not show results properly for XML results.